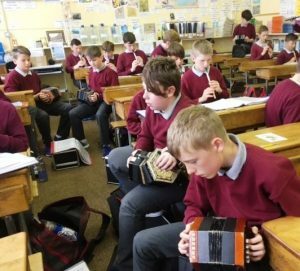 Archive 2016-17 | Friday Bridge Primary School has TALENT! “This school will be hosting a magic competition, whoever wins will be the star pupil”. As all the ingredients were put in, Charlotte knocked a whole tub of scales in. Another gush of wind flew in and knocked him off his feet! In a puff of smoke, Mr. Hales disappeared! The best witch, Mildred Hubble Bubble, won the competition. “Me, Mildred, I’m your best friend!” They all shouted. They had a great bond together, Mildred became the best witch in the world! 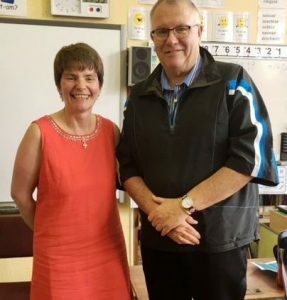 What do teachers do after retirement? Could they be rap stars? Could they sit at home watching telly? And he went back to school to learn again. This life is just for me! Our last 100WC of this school! But, before we publish, we would like to say a BIG thank you to Julia Skinner for all her hard work! It is a fantastic global project and one that we hope continues. I wonder- now what do I need? But I have enough to feed. As long as we can eat. Life in an iPhone is great! With all of the Emojis walking around the world inside, you have loads of friends and family. But everyone is different in their own way, one of the things that is the same in Emoji Land and in the human world is… there is a lot of homeless emojis in Emoji Land and one them is in a park. Mr Emo is an emoji that is homeless and lives on a small, brown, rickety bench! Just then; as Mr Emo was sitting on his smelly old bench, another emoji sat by his side. He sat with a smile upon his fat, yellow face and looked directly at Mr Emo. “ Are you ok?” The stranger emoji said. “Urrrr…” Mr Emo stumbled. He had never had such a lovely emoji talk to him before. If ever you see a homeless human in the world, talk to them and make them feel welcome in your heart. Swimming things for the beach, Things to play with and watch for on the way, What now? Oh I know just what I need! Earlier today, Lola was baking a cake. It was gonna be the best cake ever! She had all the ingredients layer out in front of her: eggs, flour, butter and sugar. Despite this, she thought she was missing something but just left it. The cake went in the oven. Approximately 10 minutes later, the cake exploded! Now what did I need again.? Mr Hales was delighted to be able to visit Mrs Boyce’s Class at St Coleman’s. 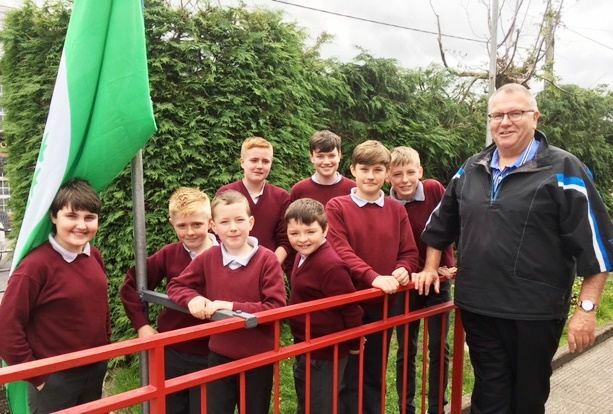 Class 4 and the boys have linked through the 100WC, as an eTwinning project. It was great to meet everyone in person and bring the project into reality! Class 4 were given a special 100WC Book which includes an entry from every boy in the class. 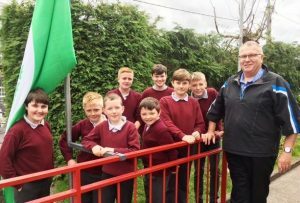 Mr Hales also heard the class band and raised the flag for the Green Award. This time we have a very gooey prompt! Is there supposed to be slime? What are the consequences of this happening? 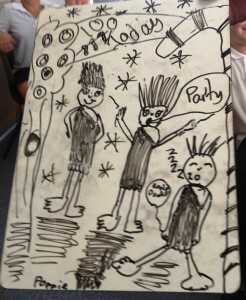 On Tuesday 3rd May 2001, a slime flood broke out into our School. It was a brown slime surprise for the janitor who entered in his pyjamas! All of a sudden, out of the blue, a magnificently big slime monster stood in the hall way with multi-colour slime dripping and dangling from him. He had an ear-piercing screech!!! The slime dripped through the roof and disintegrated the floor below. I thought what could it be aliens, monsters … snot? I went into the shed to get a ladder so I could climb onto the roof and see what was up there. When I got up there I saw the unspeakable… it was my dog drooling! In the science museum, a mad scientist failed at an experiment – a slime experiment. The slime dripped through the floor and into a dangerous bomb which exploded and made the situation worse! 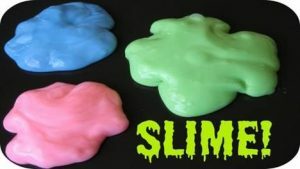 The city was covered in a range of coloured slime. The scientist got third degree burns from the activator ‘Borax’. Walking through the empty school, I searched everywhere for my coat, but there was no sign of it. There was one place left to look, the assembly hall. As I entered the room, I felt a sudden gust of air, the window had been left open. I went to close it and tried to stand on a chair, but it slipped. I hit the wall and then it was gone. Examining it, I fell and I was in a shaded room, but what had happened? I felt something grab my arm, then I found myself in my bed with chicken. Creeping through the portal, they saw an eerie, horrific house glowing in the distance; they go by the names of Ronny and Richard. Edging towards the house, the light got brighter and brighter. Once they reached it, a outline of a figure appeared. It seemed to be disordered with about eight arms from what they could make out. “ARGH!! !” bellowed Richard. However, Ronny tried to stayed strong. He couldn’t last any longer. He bolted it. Richard tried to find him but it was no use.He lost his friend forever! “And we’re back with the game!” Jeff said excitedly. “Gimme the money!” Tommy said, wanting to have a million pounds already. “You’re not getting it that quickly, chap.” Jeff replied. Tommy brought up a keyboard and put an emoji over his head. He was sad. 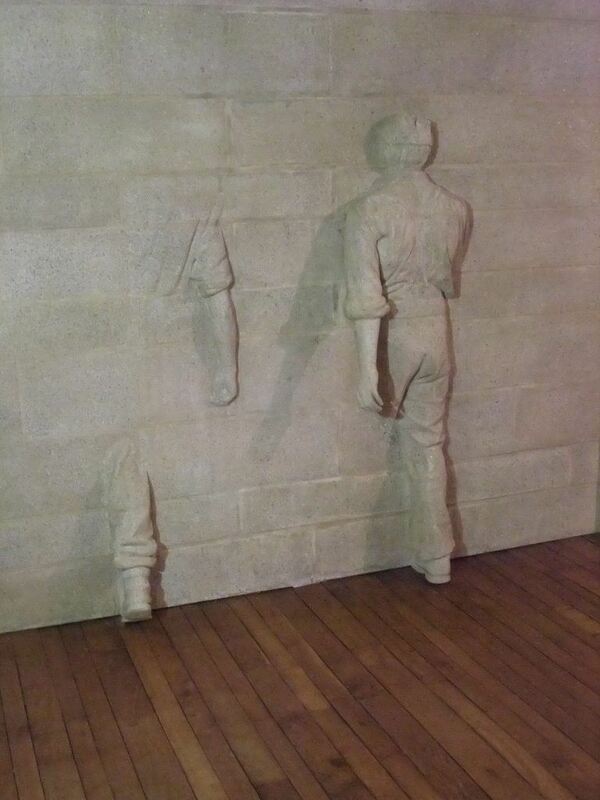 Jeff looked around, he saw some NPC’s in a wall. “Put them out of their misery.” Jeff moaned. “Nah, let’s leave.” Tommy laughed. “Yeah, they’ll get to the shop soon enough.” Jeff agreed. 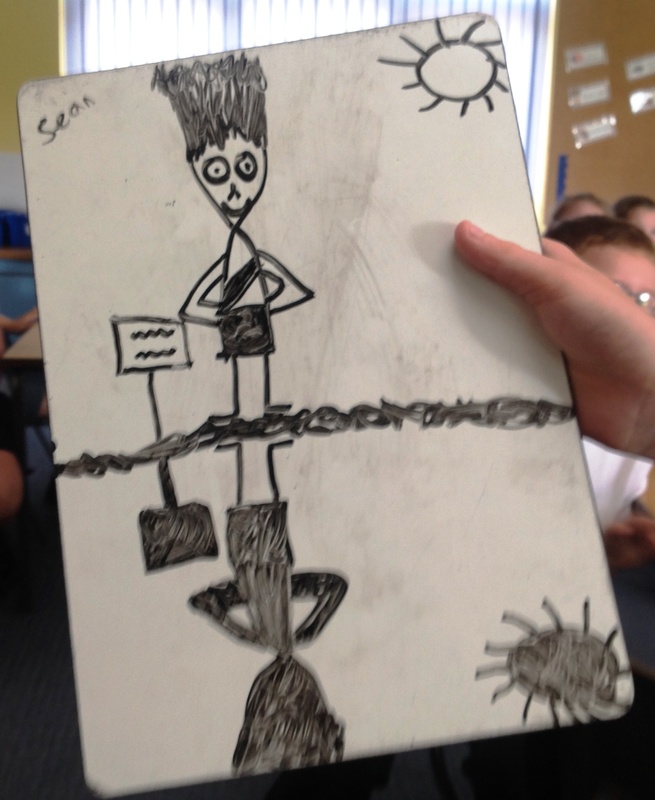 100WC: #Week 21 – Class 4 have written short 50 word pieces in response to this stimulus. They hope that their eTwinning friends in Ireland will comment. Where are you? Why do you need lights? How do you feel in the dark? USA was a calm peaceful country until they heard a enormous noises. Suddenly, all the lights went off. Something was coming from the sky and the sea. It was Godzilla and King Kong. Together, they trashed America until this hero came. It was not Batman, not Superman – it was Metal Man! He was unstoppable. He defeated them. America was saved or was it? was in big big trouble! a date night at the cinema and we were going to be baby sat by our horrifying Nan called Lizzie. out, someone wrapped their arms around me….. There was a teenager called Mike. Hhe was at home alone, whilst his parents went into town. some say it is Dave. something felt weird. For one thing this tank engine had a truck. Puff puff puff, through a tunnel. engine puffed out into the sunlight. No more Terror Tunnel! We were in prison. Suddenly the lights went out! “ESCAPE, ESCAPE!” shouted the prisoners. We didn’t listen we’ve learnt our lesson from robbing banks to hitting old ladies. “No, don’t escape your sentence will become longer!” my cell mate and I shouted. Our sentence ended. We were free at last! It was a nice summer’s day when we was at the park playing on the swings. make it, when all of a suddenly the lights went out and mum couldn’t make us dinner! furiously. ‘Sorry, it was my bad brain’, I reply. Deep inside the forest, three young campers sit telling horrifying story’s to each other. After a while they started to get more and more tired. Suddenly the lights went out, the camp fire and all the torches. And behind them they heard an eerie noise like something they’ve never heard before. “Lizzy, eh what was that?” James whimpered stumbling over his words. Unexpectedly they came back on. “Wait! Where’s William?” Screeched James. knock on the door. 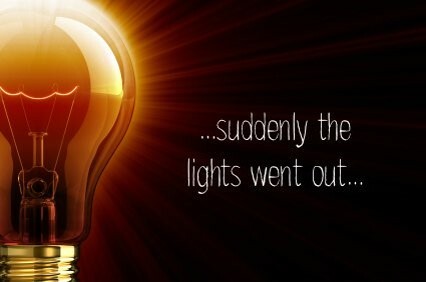 SUDDENLY the lights went out. It was petrifying. It scared the life out of me. SCREECH! I never ever want to be left alone again! Once upon a time, there was a huge man-eating pot! Its face looked as ugly as a cow’s behind. It roamed around the town of Townsville and every time it spotted a human, the Pot would jump on him and swallow him whole but leave the poor human’s legs in the top of his head. Fortunately to all the human’s delight, there was a magical storm and anything that the lightning struck would turn to stone. On this delightful day, the pot was sitting in a beautiful garden on a black block near a cafe. Suddenly the pot was struck by lightning and his rainbow-coloured blood splattered out of him. He was turned to stone! where it was. Weird? Crazy? Unreal? Legs In A Plant Pot! One day , I was walking along the path at my local park when I saw these strange legs coming from a pot. On the front of the pot there was a weird Aztec-looking face standing on a black stand by the shop. I walked to the shop and asked the shopkeeper how it got there and she said that it was built by the Aztecs but no one knew when it was built. The lady said that in a million years it would come alive and move to another destination. 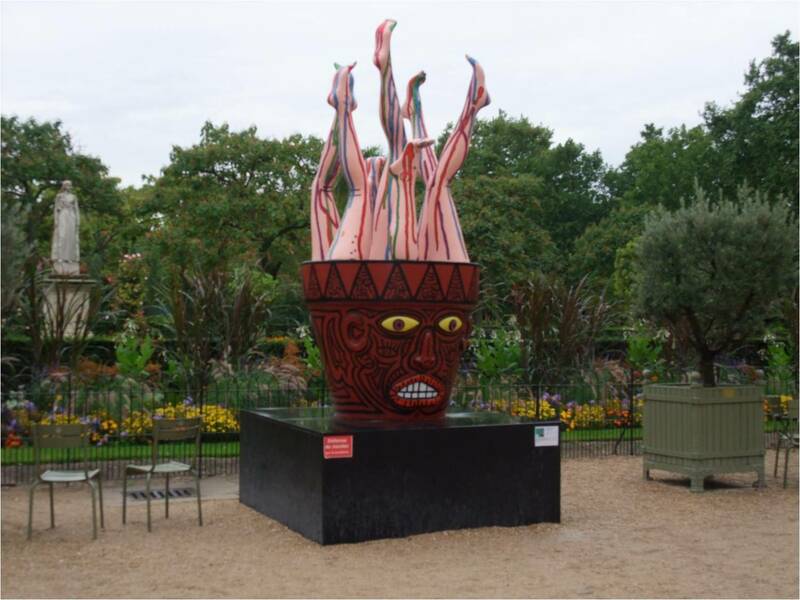 In a mysterious park there lies the amazing toothpaste legs sitting in a red face Aztec plant pot. It was transported through time. In the next fifty years, it will become a human. It looks like plastic legs being blown with air. Inside the pot is a magical place full of comfy pillows and rainbows and a random unicorn in a DJ outfit. Last Tuesday Maria was walking in a giant park when she saw an ancient pot in the back of a cafe. The pot looked like an angry man from the Aztec times. It was dark orange with bulging yellow eyes and luminous white teeth. There was a beautiful flower garden in the background. Some of the flowers were roses, daffodils and sunflowers. It was just a normal day in Gloomsdale. It was a fantastic day. There were some girls running towards the woods to explore and they didn’t know what to expect in the woods. There are weird stuff that happens in the woods. Although the woods looked normal, the further they ventured, the more weirder it became. They saw a big pot that had a red face as a furious as a person, yellow eyes and strange mannequin legs sticking out. It was so weird because their legs weren’t moving. One day, as I was walking through the park, I noticed there was a new area surrounded by a large gate. In the gate there was peculiar looking pot. Its bright, yellow, bulging eyes stared into my soul. In the pot there were, well it looked like, some legs covered in paint. I had never seen anything like it. The magnificent pot stood there like a statue. As I thought to myself, it started to be more clearer. One of the most amazing sculptors of all time must have made it. I think it will still be standing for years to come. As we walked to our boat, we were scared and frightened. We were alone and only had each other to support one another. Old Miss Peepigin was the head of our boarding school. We hated her and ran away. She caned us for getting up at night ,even if we needed the toilet. Now that we have escaped we needed to find an island that nobody lived on. We had arrived. The first thing we saw were Bones shattered, skulls hanging from cacti and broken, sharp trees. We wanted to know what caused this so we started an investigation. We eventually reached the plant that was causing this distraction. Anyone that walked in front of the yellow eyes, would face the consequences that they have made. We could see people’s legs amputated inside the plant pot sticking out…we are so dead! I woke up like any other day but I was going on a hike today. I got up and got ready and then set off. It had been 10 minutes and I was already in the middle of nowhere and then I saw it a red mysterious pot. It had legs covered in paint sticking out. Its eyes looked into my soul with its sharp narrowed teeth. It must have been built in the olden times. The legs looked real and they must have been rotting away through the years. When it became night, I rested against the pot and said goodnight but there was one thing! Why was this pot in the middle of nowhere? Last week Charlotte and Kayleigh were walking in a lovely park when they saw a strange pot at the back of a cafe. In the pot were sixteen legs covered in rainbow toothpaste. The legs were amputated from ladies in the Roman times. The mysterious pot had a face like an Aztec man with bulging yellow eyes. When we walked away the legs jumped out of the pot and then followed them back to the car. Charlotte and Kayleigh arrived home and quickly the legs kicked the boot door open. 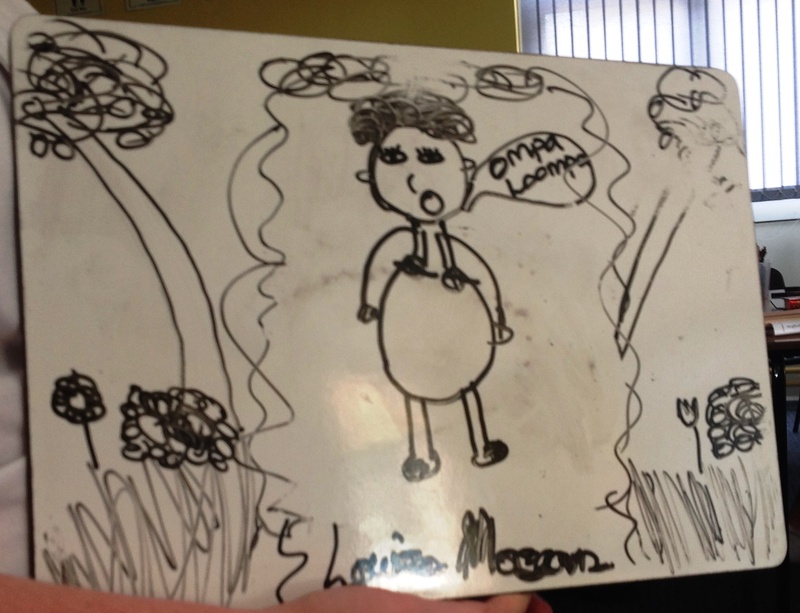 Here are the 4 winners of our Loving Laughing project – Grace, Charlie, Ollie and Saskia. 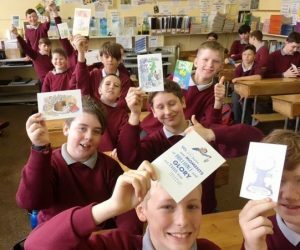 The project is part of eTwinning and is encouraging children to share their favourite joke. There are over 20 schools from across Europe taking part. 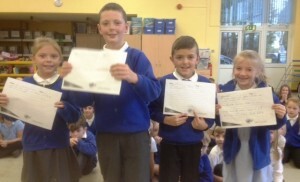 At FBPS, 30 KS2 children performed their best jokes in front of four ‘celebrity’ judges. The winners will now work with 6th Form students at Thomas Clarkson Academy to make a film, which will be posted on the ‘Loving Laughing’ website. Saskia: Why does a cow have a bell? Because its horns don’t work! Ollie: What’s the favourite shop of pirates? It’s Arrrrrggggggossssss! Charlie: How do you make a tissue dance? Put a little boogie in it! 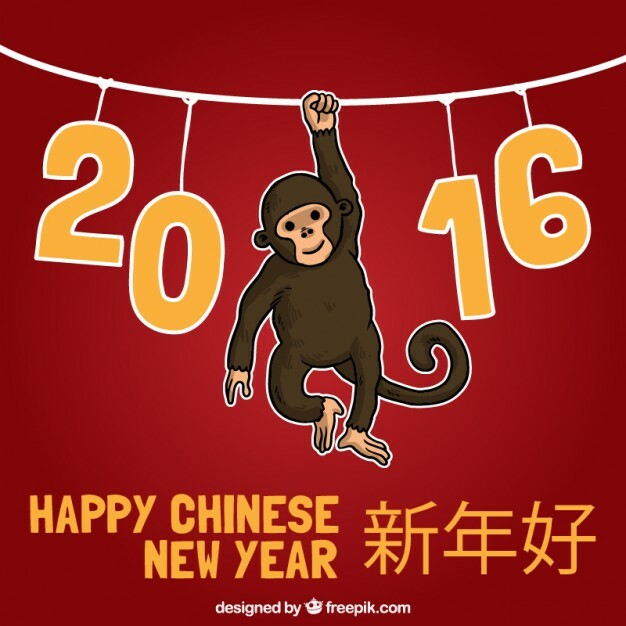 Grace: Where do monkeys toast their bread? Under the gorilla! 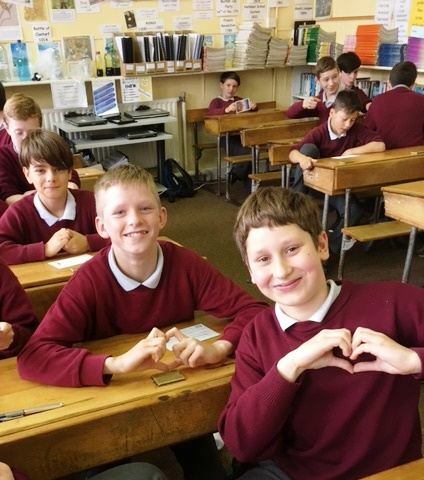 Mr Pallett’s English Group have started to celebrate Roald Dahl’s 100th Birthday by writing an Adventure story about one of the characters from ‘Charlie and the Chocolate’. 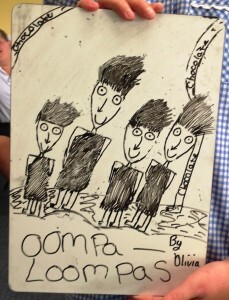 Poppie S has written about Veruca Salt. Veruca Salt is a snotty girl who is spoilt. One day, she was walking and she saw an abandoned school. She decided to investigate. She opened the creaky door and there stood the dark, wet, empty room. She walked in. After a little while, she was lost in the ginormous school. She made up her mind to sit in one of the classrooms and sob. Two minutes later, Veruca could hear a slight movement in the dark room. She closed her eyes and hoped. “No, well yes! What’s your name? asked Veruca. The girl’s name was Violet and now they were stuck together … Would they ever ESCAPE? Wow, look at him run! Urrrrrrr, was he meant to do that? Coho, you can’t catch me, CowDuck! K(NO)w body has seen CowDuck. Goes to scratch his owner. Goes to scratch his friend’s ear. With a big, heavy trumpet! 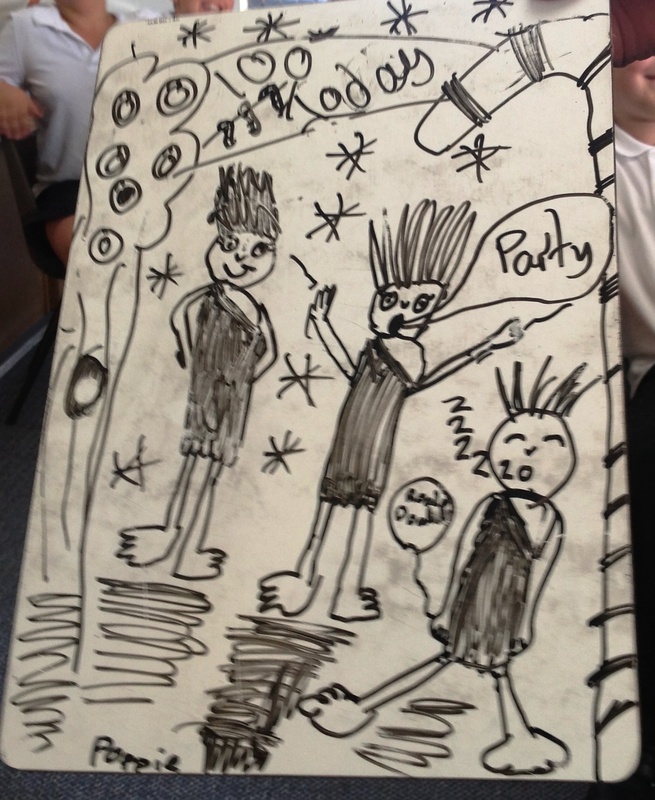 Class 2 have been working on their ‘Five Senses’. Today was all about hearing. They went on a listening walk in school and outside. What can you hear? 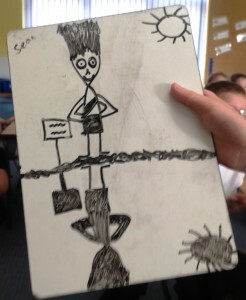 by Emma M.
I can hear a pencil. I can hear a crab. I can hear a pig. I can hear a dog. 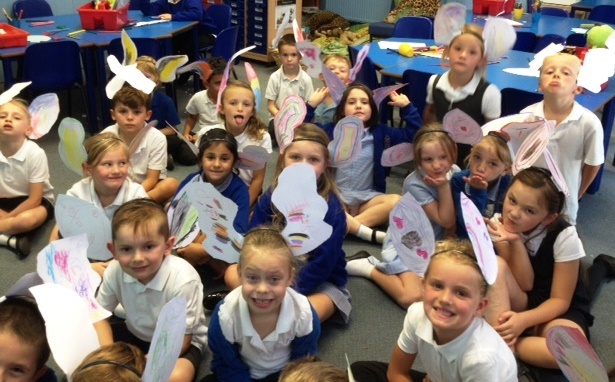 We also made ‘Big Ears’ to help our hearing, like some animals! Class 4 have joined schools from Finland and Italy to work on a ‘European Newsroom’ eTwinning Project. Each month they will publish news items using different media. In September, they have written in English and translated their reports into Finnish and Italian using ‘Google Translate’. Paul Walker, a film star, died in a car crash recently. He appeared in films like ‘Fast and Furious 6’. He died when his friend was driving a new Porsche. Paul Walker, filmitähti, kuoli auto-onnettomuudessa viime aikoina. Hän esiintyi elokuvissa kuten nopea ja kiihkeä 6 Hän kuoli, kun hänen ystävänsä ajoi uuden Porsche. Paul Walker, una stella del cinema, è morto in un incidente d’auto di recente. E ‘apparso in film come veloce e furioso 6 E’ morto quando il suo amico era alla guida di una nuova Porsche. 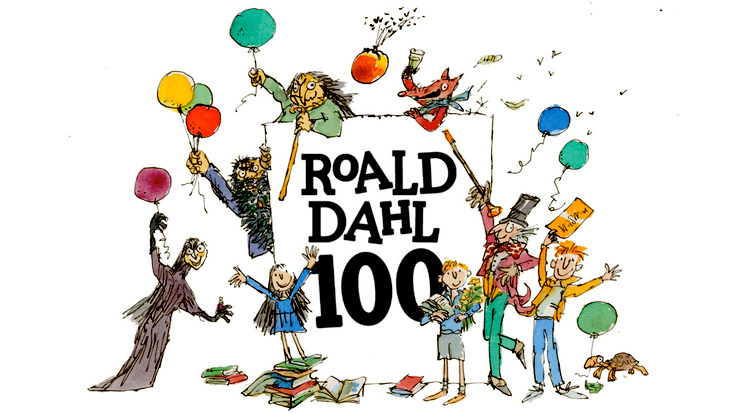 It was Roald Dahl’s 100th Birthday On Tuesday 13th September. We all know who Roald Dahl is, he is the greatest writer of all time. Here are some of his books: Charlie and the Chocolate Factory and Matilda. WE HOPE YOU HAD A GOOD BIRTHDAY!!!!! Se oli Roald Dahlin 100. syntymäpäivä tiistaina 13 syyskuu. Me kaikki tiedämme, kuka Roald Dahl, hän on suurin kirjailija kaiken aikaa. Tässä muutamia hänen kirjoistaan: Jali ja suklaatehdas ja Matilda. Toivottavasti oli hyvä BIRTHDAY !!!!!! 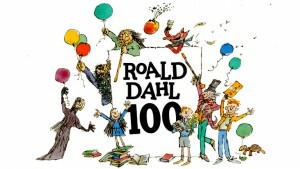 E ‘stato 100 ° compleanno di Roald Dahl Il Martedì 13 settembre. Sappiamo tutti che Roald Dahl è, è il più grande scrittore di tutti i tempi. Ecco alcuni dei suoi libri: Charlie e la fabbrica di cioccolato e Matilda. Ci auguriamo che ha avuto un buon COMPLEANNO !!!!!! One of the most endangered animals in the World’s Top 25 is the Royal Turtle. It is also known as The Southern River Terrapin. The Royal Turtle was discovered in the year 2000. On 13th September, 206 were released at Koh Kong Reptile Centre. On average, 382 out of 564 eggs hatched. Yksi uhanalaisten eläinten maailman Top 25 on Royal Turtle. Se tunnetaan myös Southern River Terrapin. Royal Turtle löydettiin vuonna 2000. 13. syyskuuta 206 vapautettiin Koh Kong Reptile Centre. Keskimäärin 382 ulos 564 munat kuoriutuneet. Uno degli animali più a rischio nel mondo della top 25 è la Royal Turtle. E ‘noto anche come il fiume del sud Terrapin. The Royal Turtle è stato scoperto nel 2000. Il 13 settembre, 206 sono stati rilasciati a Koh Kong Reptile Centre. In media, 382 su 564 uova schiuse. Me (Charlie) with my family in 2015 went down to Roydon Common in Kings Lynn. I found what I thought was an old tool. My dad looked. It resembled a bomb and we called the police. Apparently it could have blown up! Me (Charlie) perheeni vuonna 2015 laski Roydon Common Kings Lynn. Löysin mitä ajattelin oli vanha työkalu. Isäni näytti. Se muistutti pommin ja soitimme poliisille. 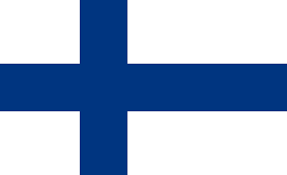 Ilmeisesti se olisi voinut räjäytettiin! Me (Charlie) con la mia famiglia nel 2015 sceso a Roydon comune a Kings Lynn. Ho trovato quello che pensavo fosse un vecchio strumento. Mio padre guardò. Assomigliava una bomba e abbiamo chiamato la polizia. A quanto pare avrebbe potuto saltare in aria! Year 6 really, really want to improve their writing, so we have started the Year 6 Writers’ Club. “Oh, just another Irish Day,” the Grey Bin expressed depressingly. “Why are you eating my cardboard? I was going to scoff it up!” sighed the Cardboard Bin reluctantly. “I’m filled to the ol’ naggin anyway!” he mumbled in despair. “My cans are killing me!” suffered the Can Bin painfully. “Sssshhhhhhhhhhhhh!” hushed the Grey Bin loudly. 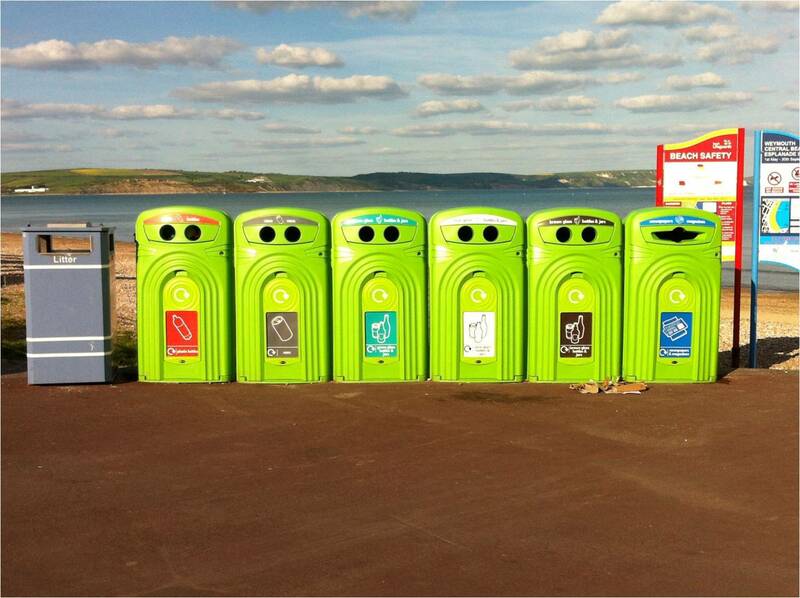 All was not well between the bins … bicker, bicker, bicker! 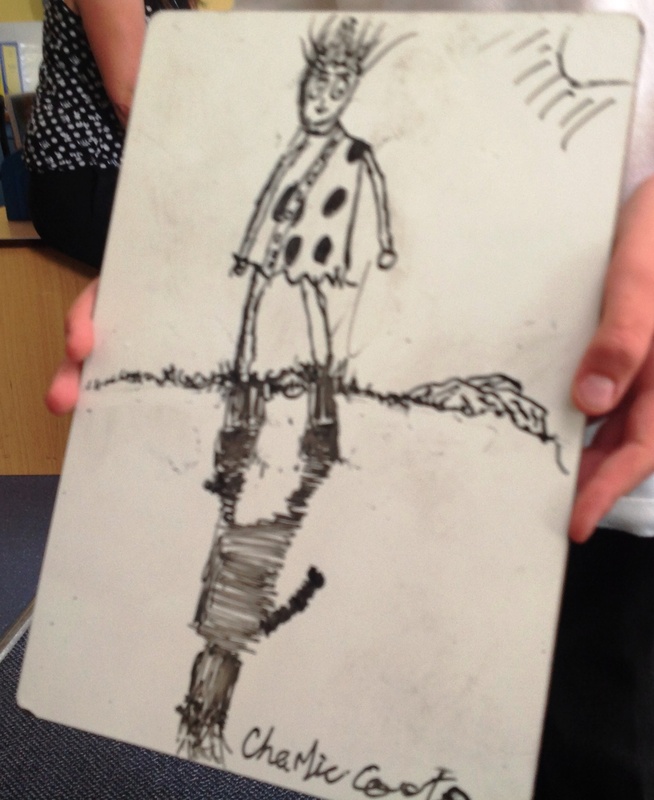 At the beginning of the Summer Term, we have been writing adventure stories. Moo and Larry fell in love since the day they met. Larry was two weeks old and lived down the farm. Every time Moo went down the farm, she stumbled through thick and thin mud just to see him. Shining and gleaming, the sun was peeping through the clouds, so Moo thought a walk would be great. She found some rope and tied it round Larry’s neck, making sure it was not too tight. Whistling and singing as sheep and lambs do, they walked happily. In the corner of Moo’s eye she saw a … HOLE!?! Moo decided to peek her head in the hole. Suddenly Larry bucked Moo up the backside. Rushing and scurrying passed Moo, Larry ran away. Moo decided to give chase. 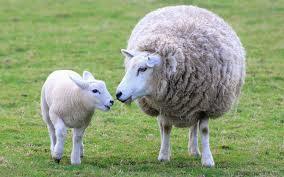 Finally, they reached and came across a farmhouse where they could smell a roast dinner of lamb and mint sauce. “Oh no!”, they exclaimed, “we had better turn back immediately!” Moo suggested that Larry should cover his eyes as she didn’t want him to be frightened! 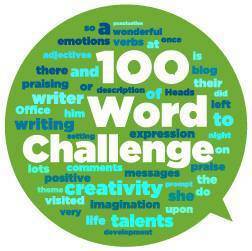 We are using the ‘100 Word Challenge’ as our weekly stimulus. Many children from around the world are presenting their writing on the website http://www.100WC.net Why don’t you have a look? 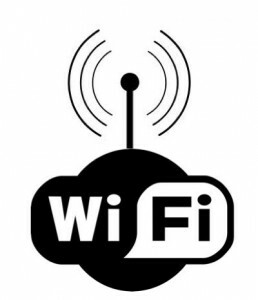 This week I lost my Wi-Fi connection at home. I was in a real state which was quite worrying that life can be so dependent on the internet. Anyway, the good thing was that a local coffee shop let me use their connection and I was able to get it all done. What / who was being connected to what? Why would it be a problem if it was broken? What happened after the connection was broken? It happened just at half-time, when the connection broke. I had 5 minutes to exit. The first thing I thought of was to phone BT. I screamed at them like they’ve committed a murder> The second I thought of was to see if my laptop worked but it didn’t. I chucked it through the window. I did try to phone BT again, but they were busy. Well, then, it popped into my head that I could steal my neighbour’s WiFi. For the last two minutes, I tried to crack the code. With just 20 seconds to spare, I cracked the code and I was able to watch the match! The lady next door uses the internet so much that the internet always goes out. Don’t get me started about when her grandchildren come over – all they do is go on the internet. But one day their internet went out and I saw the electrician repair it because he is always coming over. That’s all I heard when the connection broke. They then called 999 – the police were NOT happy. My Mum and I just laughed. Everyone was gobsmacked! This week we have a photograph for you to look at. 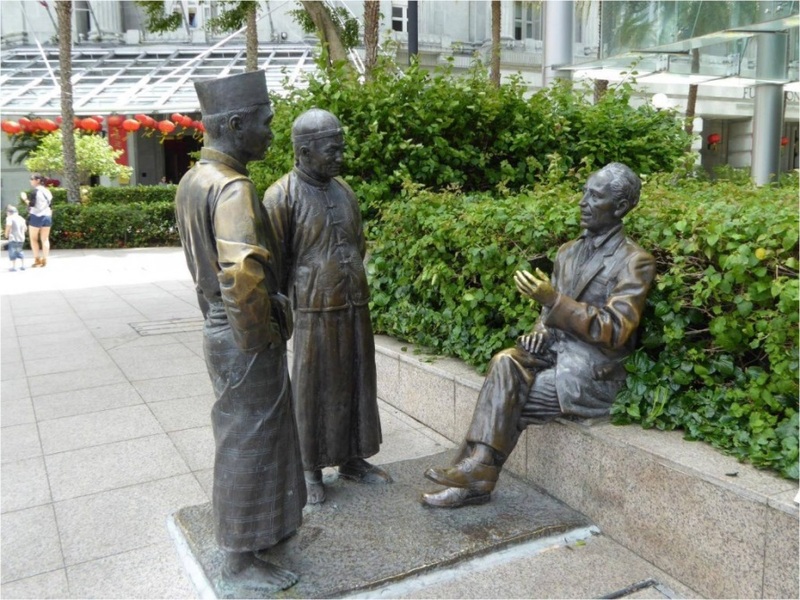 It is a statue of 3 men talking. Look at how they are dressed? What country might they be in? What could they be talking about? As I was sitting on the bench, two strangers, dressed in religious clothes, slowly approached me. “Hello strangers! What do you want?” I whispered. “Hello! We’d like to talk to you, if that is alright,” they replied. “I guess so,” I answered. “Can we ask you? Do you believe in God?” they asked. The two men looked at each other and weren’t sure how to answer my questions. So they quickly turned around and left. Were they religious men or was there another motive? 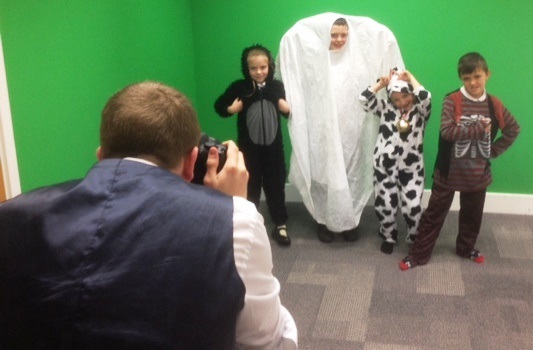 On March 4th we celebrate World Book Day when schools often let pupils dress up in their favourite book characters. Here on 100 Word Challenge, we want you to write about SUPER HEROES. “I’ve come to stop you from stealing all the money from the bank,” shouted Batman. Suddenly a Batarang (that’s like a boomerang!) flies past Joker’s head. Joker pulled out his knife throwing it at Batman. He jumped, somersaulting into the air – Batarangs fly everywhere! Joker jumped and dived to avoid them. He managed to grab Batman and pulled him to the ground, punching and kicking him. 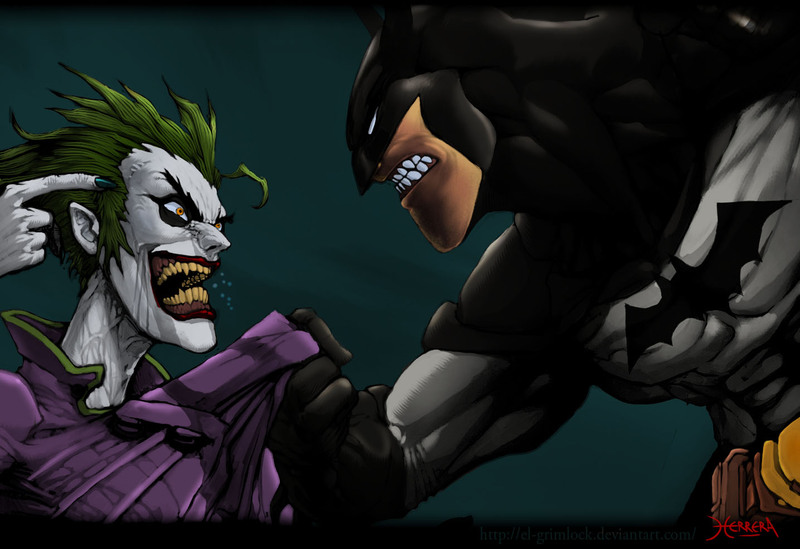 Fighting back, Batman pushed a button on his utility belt, wrapping a rope around Joker. Superhero … that word makes you think of characters like Batman and Superman, doesn’t it? Well, Naruto Hetalia (a 14 year old, outcast-ed girl) is a superhero in her own way. 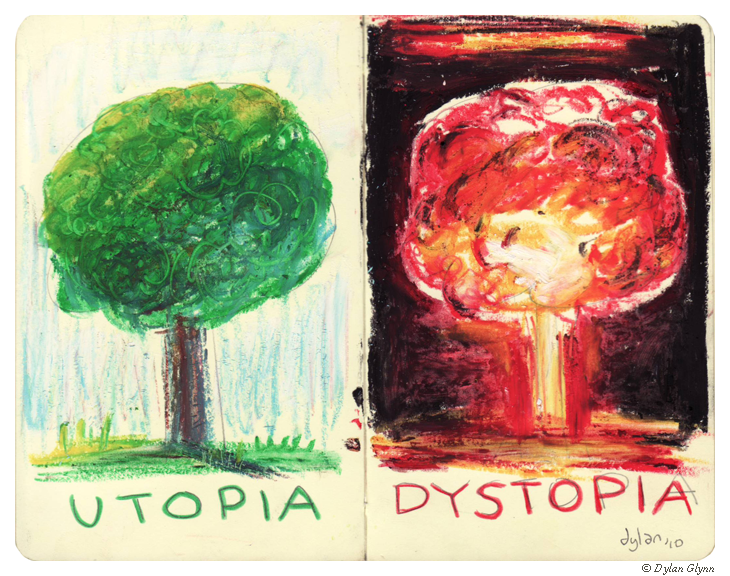 Where she lives, there is a district where everything is perfect – utopia, you may say. However, in contrast to that is a barren, isolated land – a dystopia. You may be imagining rich and plentiful lands with beautiful architecture inside of this district. Wrong! It’s actually a depressing, poverty-living place where many craters blanket the muddy floor where grass used to grow, Not only did it take advantage of the ground, but it also took advantage of Naruto’s left leg. Despite this, she still helps with the farming and covering all the remains of war. THAT is a real SUPERHERO! Under the green, gas-smelling water, there appeared to be a cranky-looking, crippled crocodile. I pranced back like a scared cat. I was likely to get gobbled up. 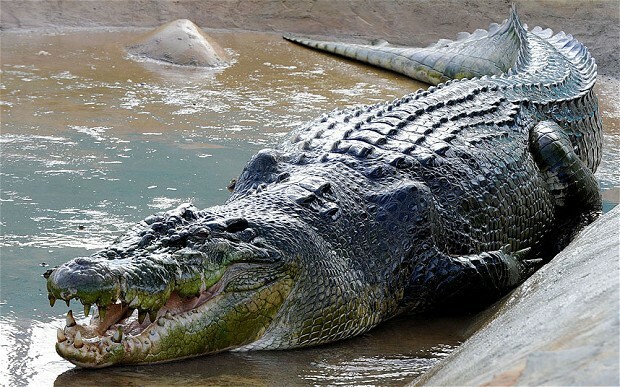 The crocodile was swimming in a sophisticated way. I ran as fast as lightening to hide beside a tree. On reaching safety, I was able to a professional dance show. I was thirsty and went to the crocodile jaw-looking tap that was jutting out of the water. “I’m hallucinating”, I mumbled. There was gas leaking like coke out of the bottle. I fainted. As I woke up, I saw a small, lizard-like crocodile. “I don’t know why it’s here,” I thought to myself. “Ca…N…N…N…Yo…U…B…E…E…My…Be…st…friend?” said a deep, croaky voice. “Excuse me,” I said sarcastically. “Was that you?” I asked. “People must just freak out when they see you” I explained. ” I know! I’ll hide and stay here when you go out!” whimpered the lurking, croaky croc. “OK!” I murmured. Everyone was happy from that point on. “What’s your name?” whispered Jeff. “I can’t tell you. It’s personal information!” announced Peter. “Well, I’ll just call you Gentleman then. Let’s forget about names. Look, Gentleman, there’s that red and gold dragon coming, I think!” answered Jeff. “How many legs do you think are under the dragon?” questioned Peter. “I don’t know, but I should imagine there’s about 30 or more,” warned Jeff. “Probably about that many, but they must be very well trained to perform the tricks they are doing,” shouted Peter. “They’re very well trained! 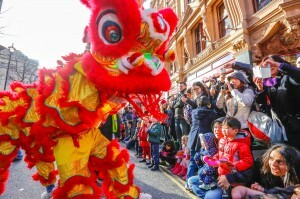 I’d like to see more of the dragon but that’s the end of the show,” exclaimed Jeff. “So would I, but, maybe we can watch it again next year,” warned Peter. 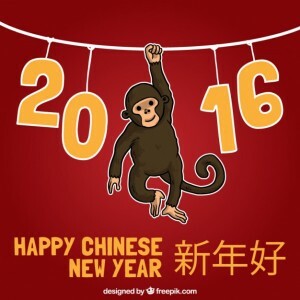 “On yes, we can watch again next year because Chinese New Year is every year!” shouted Jeff. This week we have a picture. It was drawn in 1899 by Jean-Marc Cote and is how he would imagine how fireman would work in the year 2000. Thank goodness he was not correct! Look closely at the action. I watched the scorching flames and red embers dancing above the lady’s head. 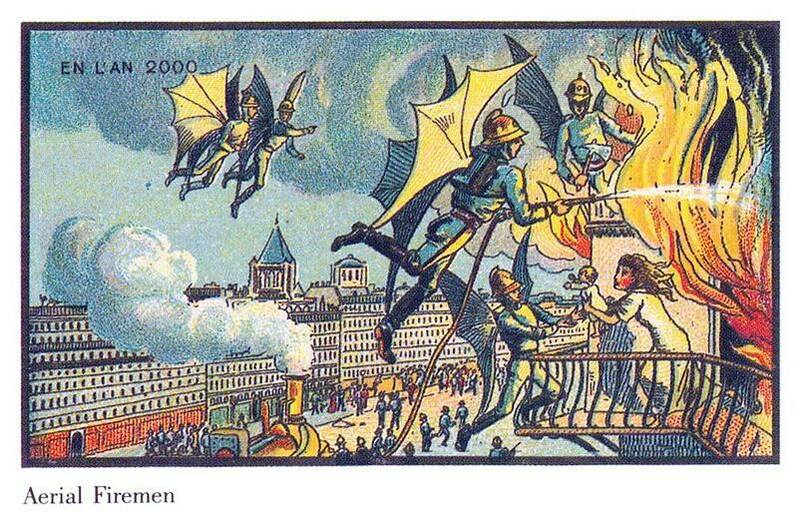 Some danced, some pranced, but I stood in horror as the aerial firemen risked their lives and limbs. I felt so sorry for the lady and her baby, but I ran to protect my own, little family. “Pass me the baby! There’s no time to lose!” ordered the brave fireman. The young mum passed the baby to the super-fit aerial fireman. Night fell and I gazed at the stars – twinkle, twinkle. I was so relieved that my little family were safe and sound. This week we have part of a sentence. 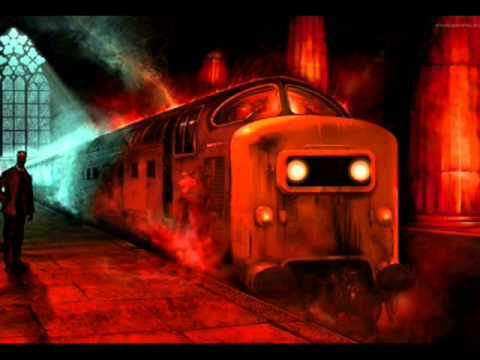 The legend says that a train picks up lost souls and takes them to hell. But, once every ten years, a man gets trapped on the train, never to be seen again. “Ha!” shouted Jake interrupting. Jake’s friends were camping and it was Greg’s turn to tell a story. The fire started to die out. “I’ll get more wood. You behave whilst I’m gone,” ordered Dan. But, as usual, Jake sneaked off. Later that day, when everyone knew that Jake had gone, Greg grinned as the train had come. This week we have 5 words. 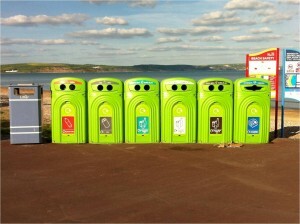 They must all be in the post but can be in any order. Before you start, think about a story that could include all of them sensibly. Not a lot of people admire school dinners, especially when Mrs Redhead, the school chef, cooks them. Apparently, there are rumours that the ‘meatloaf’ once floated into space and never came down. After that incident, everybody at Umbrella Primary School always had a packed lunch! 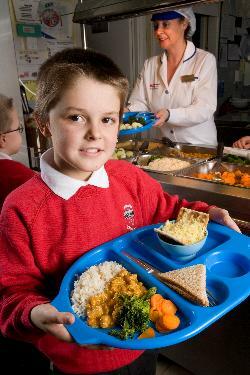 One day, a boy called Nugget was dared to eat school dinners in a game of ‘Spin the Bottle’. So he did! Munching and chewing on the hard, stale substance, he felt so sick that he wanted to jump off a mountain. Suddenly, as Nugget chomped the last bite of the burger, he started to fly!